The play is based on the story by André Schwarz-Bart and Jiří Langer as well as true stories. 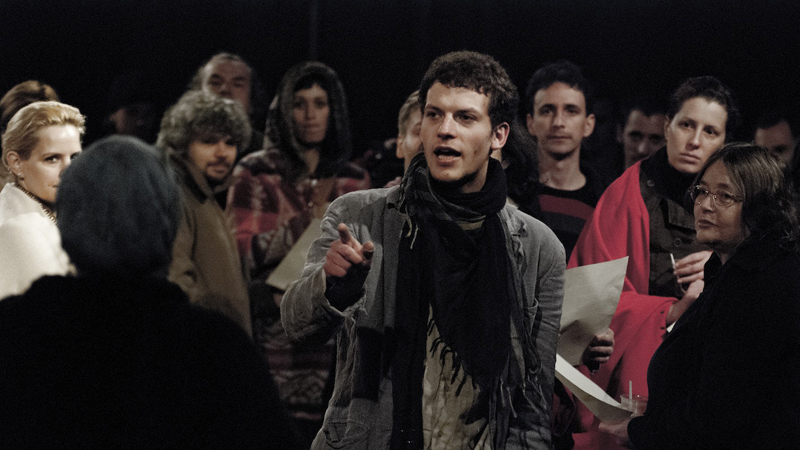 The production of the piece started in November 2011 by a group of professional actors, musicians and civilians, and was premiered at spring, 2012, in a synagogue called Rumbach Sebestyén, which is an abandoned house out of function since the 1950’s. The audience took part in the instances of a ritual and some important happenings of the village called Lyuta. They were all taken as the community of the piece. Each performance transformed into a ritual of an occasional community. The scenes of the performance are predominantly public scenes – a court trial, the Friday night, a village assembly. The performers and the viewers are together in the “ritual space”, viewers are considered as part of the fictitious community, the performers act like the outspoken, loudest members of a real community. Elements of the Friday night ritual and those of other Jewish rituals (songs, prayers, actions) were applied and story was told within the framework of these. The viewers became the participants of the ritual, of the community and also the story. It is the story of a fake messiah taking place in Ukraine in the 18th century. A young, energetic and charismatic stranger arrives in the small community and through a series of small tricks and practices he makes the community believe that he is one of the thirty-six righteous men, who have been selected by God to take the burden and suffers of all people. However, he is not as prepared to become a myth as he previously believed. The religious community glorifies him so much for the new hope and enthusiasm he brings that the secular leaders of the village recognize considerable danger in him and he truly becomes a martyr. Besides the eleven professional actors and musicians ‘on stage’, four civilians from the Budapest Jewish community were also taken in the project through the creative process and also in the performances, who were considered as the contemporary representatives of our story. The piece was staged eleven nights since 2012. Each night it was played with a full house, with an audience of 80 people, which was the maximum capacity of the space.